This past weekend I had a chance to visit a place I've wanted to go to for a long time: Baker Hot Springs, about 20 miles northwest of Delta, Utah. I had read in the very informative Millard County Tourism Guide about this hot spring, which they called a Mini-Yellowstone. I scoffed. Surely there couldn't be something that cool around. As it turned out, I was really impressed with the hot spring for a number of reasons. It was hot. Very hot. Scalding hot. It smelled like sulfur, a smell that immediately transports me to Yellowstone. And best of all...it had soaking pools nearby! 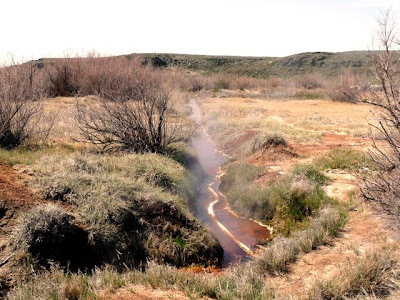 The reason that there is a hot spring in existence is due to the nearby Fumarole Butte, a large volcanic area that's only about 6 million years old. Apparently that is very young by geologic standards, and there is still some active magma not too far below the surface that is heating this water. Fumarole Butte is a Quaternary basaltic andesite shield volcano. It overlies minor outcrops of Tertiary basalt and rhyolite erupted 6.1 million years ago, contemporaneously with rhyolite of the Keg and Thomas range 10-30 kilometers to the north and west. Fumarole Butte has normal magnetic polarity indicating eruption during the Jaramillor event. The volcanic neck which provides the name Fumarole Butte is at the center of the volcano and rises approximately 30 meters above the gentle slope of the shield. The volcano was inundated briefly by Lake Bonneville, and there are scattered remnants of lacustrine deposits. Benches developed at the Provo level (1,463 meters). 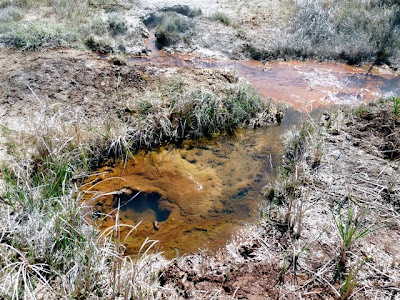 Crater Springs (also known as Baker Hot Springs and Abraham Hot Springs), on the eastern margin, produced thermal water (87-90 degrees C) at an estimated discharge rate of about 17 liters per second in the summer of 1967. The soaking pools consist of three small pools, each of which can hold about two people stretching out or more if you don't mind sharing. Apparently at one time someone wanted to make a little resort out this way, but I guess it was just too desolate to make a go of it. Here you can see the pools with Fumarole Butte in the background. When we arrived, a local was there to explain the heating and cooling system for the pools. We were lucky to have him help us, because even though it sounds simple, it would have taken us awhile to figure out. The water from the natural hot pool runs down a little creek and is diverted into a channel on the north side of the pools. This water is extremely hot, so hot that if you fell into just that water you would need to take a trip to the hospital. In fact, the local said there can be problems with people coming out to party and drinking too much and falling into this extremely hot water. Amazingly, there is a cool-water spring that emerges just a little to the west of the hot spring (between the spring and the butte). 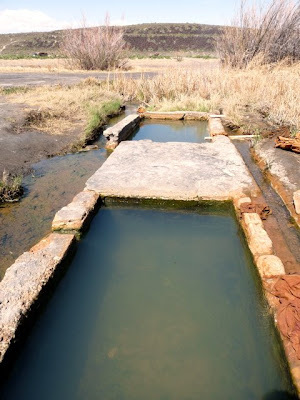 This cool-water spring is smaller, but it provides enough water that with a little plumbing, the perfect temperature can be achieved in the soaking pools. The local told us that it takes about 20 minutes to cool down a pool that is too hot, but only about 15 seconds to heat it up, so we kept that in mind as we experimented. 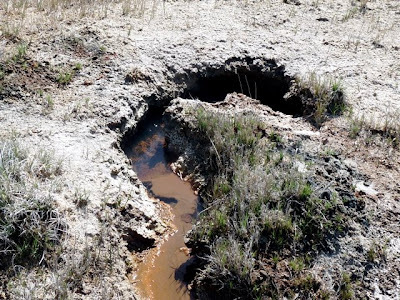 There are short pieces of PVC pipe that can channel the cool water over the hot water ditch and into the soaking pools, and pieces of discarded clothing and towels to act as dams to keep the hot water from entering the soaking pools. 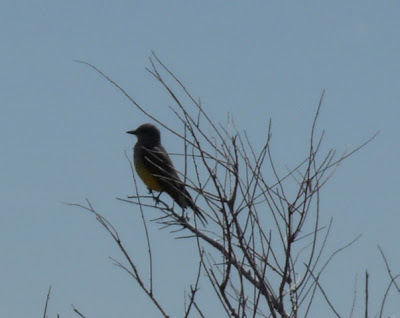 Surrounding the area is a variety of vegetation and wildlife, including this kingbird. I saw my first kingbird of the season last week and am glad to welcome this noisy species back. 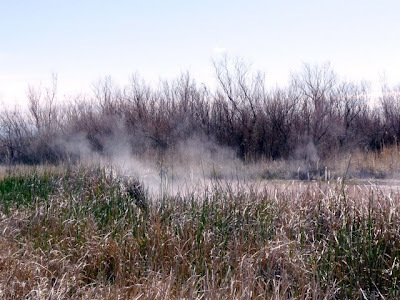 Surrounding the big hot spring is a lot of knee-high vegetation, and the day was just cool enough that the steam rising off the water provided a nice contrast. In this photo you can see both the steam and the Fumarole Butte in the background. I didn't realize it until I got home and pulled up a Google Earth map that the spring area is much more extensive than can be seen from the parking area. After an enjoyable soak, I headed up the channel to find the source of the hot water. 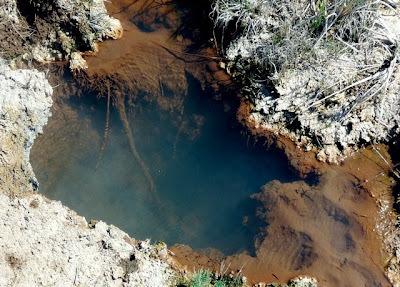 What I found were several hot springs. One had a lot of algae growing on the top. 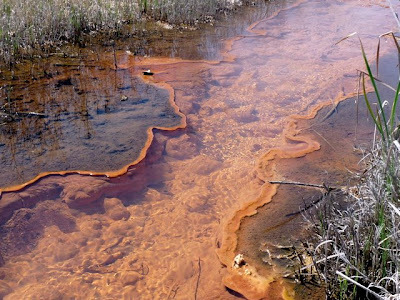 Another was burbling up from a crack in the earth's surface, with an especially strong odor of sulfur. Another springhead was darker blue. 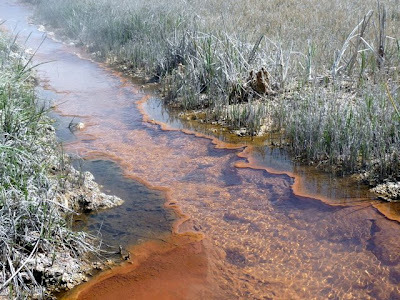 The hotter the water, the darker it is due to the different types of bacteria that live at different temperatures. The cooler water had lots of orange bacteria, but cool is relative--it was still hot enough to burn a person. And hot enough to kill a sheep. 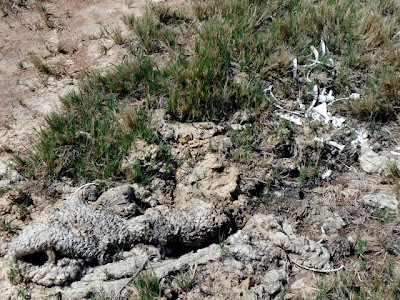 This wool and pile of bones was next to the hot spring channel. Here's a view of the channel looking south, towards the soaking pools. 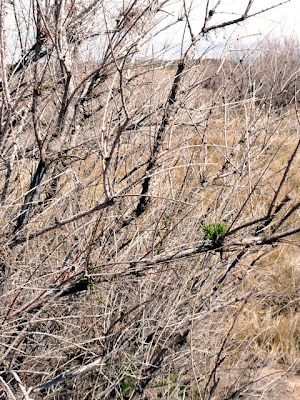 There are some salt cedar (Tamarix ramosissima) trees around the area, but they appear to have been treated with the very successful salt cedar leaf beetle (Diorhabda elongata), which defoliated them. I found one tiny patch of greenery growing back, but it's so nice that the salt cedar haven't grown so thick as to prevent access to the area. There are a lot of minerals in this hot water, and it appears that they are building some travertine along the hot spring channel. It takes on fascinating forms. 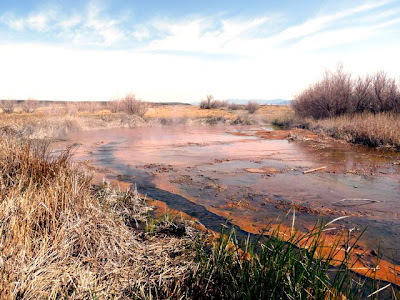 For the most part, the spring was relatively clean, although there was some trash downstream and some beer cans by a firepit that looked like it was from the night before. Occasionally folks clean out the soaking pools, which can get algae-filled and slimy and get a lot of sediment in them. Depending on the last time the pools were cleaned may dictate the conditions--and how much you enjoy your soaking. Hopefully people who visit this cool hot spring area respect it--otherwise it won't be worth visiting. Pick up a Millard County Tourism Guide and you'll find some photos, a description, and maps of Millard County that will help you get to the hot springs. 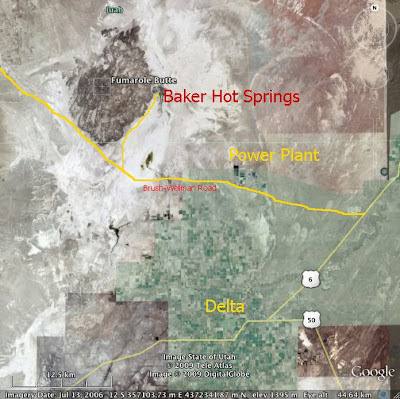 The basic directions are get on the Brush-Wellman Road, go about 11 or 12 miles west of the power plant, and turn on a good gravel road that is before the huge volcanic plateau (Fumarole Butte). Head north just over seven miles, and the springs are on the east side of the road. Interesting! I've never even heard of that place before. What a fantastic place - nothing beats a soaking pool! Especially one that is heat to taste! We'll have to visit this some day. Never knew it existed! Fascinating that geothermal features are so close by. 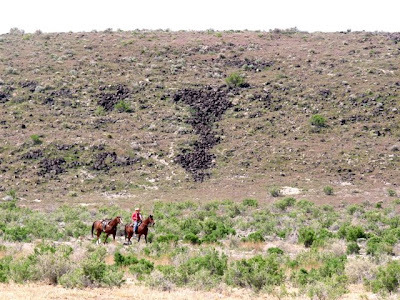 We'll have to visit this unique spot in the remote desert. Great info, thank you for sharing it! I'll be in and around St. George mid month and look forward to exploring here. Can you reccommend other nearby hot springs? Thanks. Thanks for the informative post. We'll be visiting next time we head out there! Thanks for the post. We have been there several times, an interesting place to explore. Unfortunately some people do not know that beer cans do not burn and that plastic soda bottles do not dissolve in water. But other people keep the place clean and pick up the mess others made. Its a beautiful place and a hike to the fumarole butte is interesting. We love Delta and its surroundings, friendly people. I first learned about these springs back in the early 50s My Father was born in Lemington about 35 miles east of Delta so its very close to where he grew up and he spent time there catching wild Mustangs .He introduced me to it when I was 5 that was 1953 and I have been there many time especially enjoying it when I came in from the North from Fish Springs in the winter with my 4X4 and in a lot of snow the hot ponds or tanks were great with all the snow around .Later on when I married My son and now his son have spent alot of time there. Its a great place with the exception we always seem to have a few who thing these places are there private garbage dumps.But most are good people and bring out more than they take in. I live in Oregon Now and miss them alot.I was lucky though I found another similar place in South East Oregon that is a lot more remote and does require a 4X4 to get into it so I guess I have the best of both. Thanks for the site it was fun to go back and remember about it even though in my old photograph alblums I have many of the same pictures only at a earlier time. "a local was there to explain the heating and cooling system for the pools. We were lucky to have him help us, because even though it sounds simple, it would have taken us awhile to figure out." Can you explain this. Also, can you explain how these soaking pools drain. Thanks! Thank you for posting this. 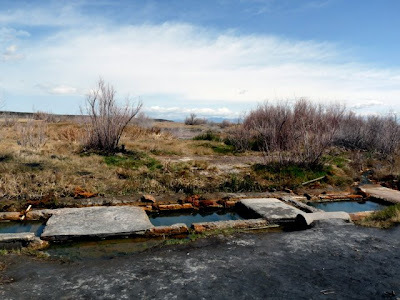 After reading your blog I added a visit to Baker Hot Springs to this weekends campout. It was a fun and unique experience. You said her skin was pink, not on the surface but underneath, the way people’s faces look when it is cold outside and not so much the way people’s faces look when they are in the desert. And I remember that, though I am sure I’m forgetting other things, maybe even key ones, that didn’t seem key to me at the time.